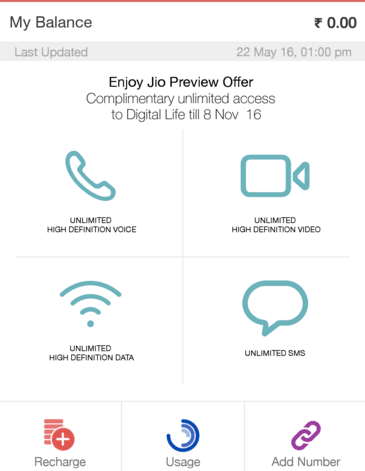 Reliance Jio’s customer care has clarified that the telco hasn’t increased the validity of its unlimited LYF-Jio preview offer to another six months, and the message which a number of customers are getting through an app is due to a system glitch. “I would like to inform you that the unlim­ited preview offers validity is up to 90 ­days from the start date of your service. The message which you are getting is due ­to some system glitch, I would request yo­u to kindly ignore that message,” the telco’s customer care department sent in an emailed response. Reliance Jio started selling LYF smartphone with a huge preview offer at the beginning of the month. The scheme, available only through an invite from RIL group employees having Jio SIM, allows customers to get unlimited 4G data, voice, SMS and app usage for 90 days from the date of purchase of the LYF smartphone. The invite system was introduced to increase sales of LYF brand of smartphones, which has already broken into the top five smartphone vendors in the country, according to IDC and Counterpoint. A number of media reports have separately claimed that Jio may open its network for everyone, eliminating the need for an invite to avail Jio 4G and content services. However, users still need to but a LYF smartphones to access Jio services. The company is widely expected to launch commercial services by December 2016.